French bulldogs are intelligent and sweet natured and tend to 'bond' with one person. They love people, are good with children and do not bark unduly. French bulldogs enjoy their comfort and have uncomplicated exercise requirements, making them ideally suited to apartment living – or a companion to one who has a driving job. They are also happy to go for a roam about on a lead. 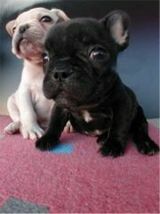 French bulldogs are bright and inquisitive, if a little unpredictable! They are quick to learn simple tasks – can be stubborn on occasion. French bulldogs only shed a little hair which can easily be remedied with weekly brushing with a rubber brush. In the mid 1800's when the English lace-makers emigrated to France in search of better jobs – they took with them their much loved toy bulldogs, which were popular household pets at that time. 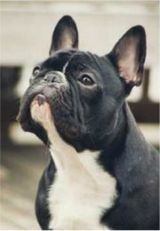 These where then crossed with other breeds which produced the erect bat ears seen in French bulldogs today. Purely bred for companionship and being a pet – this breed remains popular in France and America. Life expectancy 9 - 11 years.